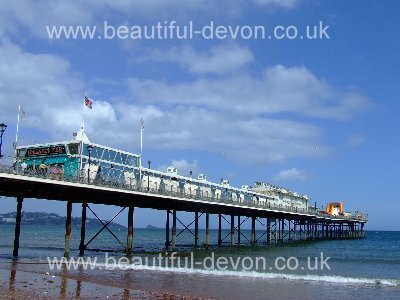 Paignton Sands often claimed to be the longest uninterrupted stretch of sand in Torbay, but in fact bisected by the Pier, backed by the Green. Only a short walk from the candy floss sellers and amusement arcades of the town centre. Take a donkey ride. Or just sit on the promenade watching the world go by? A fine sandy beach with lots of facilities nearby. Very popular for a South Devon holiday. Preston Sands Heading north around the Bay towards Torquay is Preston Sands, Paignton. Backed by a 1/3rd of a mile long promenade, on top of which stand so colourful beach huts. 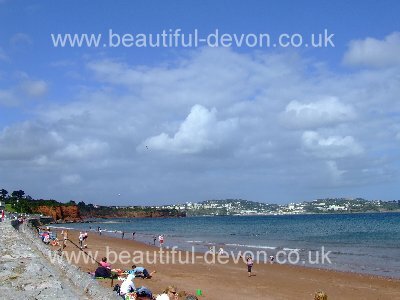 Small sheltered beach popular with families, only a short walk to Paignton Sands. Goodrington Beach more correctly Sands . Over half a mile long North and South Beaches with the Inn on the Quay in the middle. South Beach backed by Quaywest, with an amusement arcade. Gift shops and cafes, even an ice cream quiosk. Inn on the Quay, with its south facing outside tables offering mouth watering food, and always popular deservedly so. The beach has a dog ban in season. 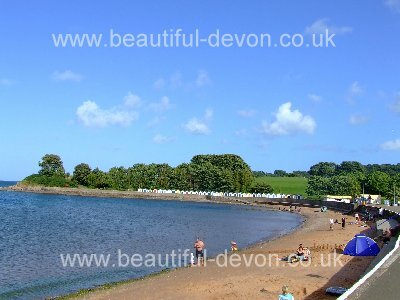 Both of the Goodrington beaches are gently sloping and sandy beaches very popular with families. In the background the oh so nostalgic hoot of the steam trains of the Dart Valley Railway, running from Paignton to Kingswear. Beach huts under the headland of Cliff Gardens on North Beach. Watched over by Goodrington Cliff Gardens with its zig zag paths and subtropical feel, offering stunning views over the bay. The gardens are well known for their night illuminations. Take a pedalo ride on the boating lake? Continue around south the bay to Broadsands. Broadsands Beach - in a half mile long wide sweeping arc, backed by a promenade. So distinctive beach huts, with acres of car parking and protected open space. At low water the tide often goes out over 100 metres from the promenade offering up a huge expanse of sandy beach. The beach gently shelves, with high sandstone cliffs at the north end, and the low cliffs and grasses of Elbury Common and golf links to the south. 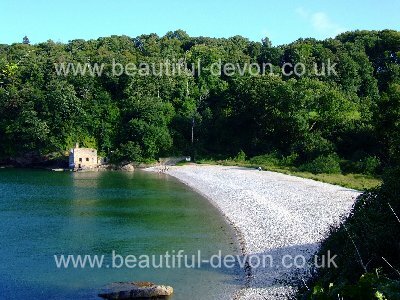 Broadsands Beach is also very popular with families enjoying a South Devon holiday. A café and restaurant, life guards and dog ban in season. Hire a deck chair or a sun lounger. Hoot hoot and chuff chuff of the steam train as it pulls away to Kingswear on the Paignton and Dartmouth Steam Railway. Excellent Devon Coast path walks are available across the Common to the even more rural Elbury Cove, or further afield towards Brixham. Elbury Cove. The ruin is not a castle or a fort, but what remains of Lord Churston's 19th century Bathhouse. A print from Torre Abbey Museum dated 1912 shows the building to be thatched. Did you know the bathhouse contained a sauna and an open air sea water pool? The Cove is a designated water ski area, so any thoughts of having peace and quiet in a so beautiful location are dashed when the first 150 hp power boat roars into view. Also known as Elberry Cove. The Cove is reachable via a short largely level and very enjoyable walk around the edge of the golf course from Broadsands Car Park. Delightful shingle beach, quickly shelving to deep water, hence its popularity with water skiers. The beach is backed by a wooded hill. Walkers can continue along the South Devon coast path, through the woodland towards Brixham. Fishcombe Cove. Reachable down a steep path, with a flight of steps at the bottom, or else walking northwards along the Coast Path from Brixham. 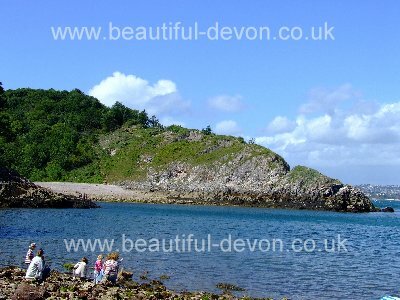 Backed by low cliffs, and with fine views across the Torbay and into Churston Cove.